The Victorians certainly knew how to put on a circus – a display of acrobatics, animals, strength and freaks which unwholesome enjoyment for all the family. 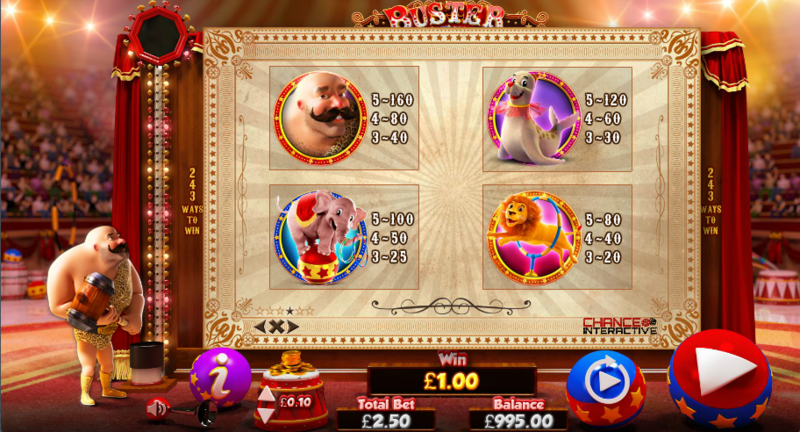 Their legacy now lives on in a number of online slot machines and Buster Hammer is one of those; it’s developed by Chance Interactive and it’s described in full detail below. 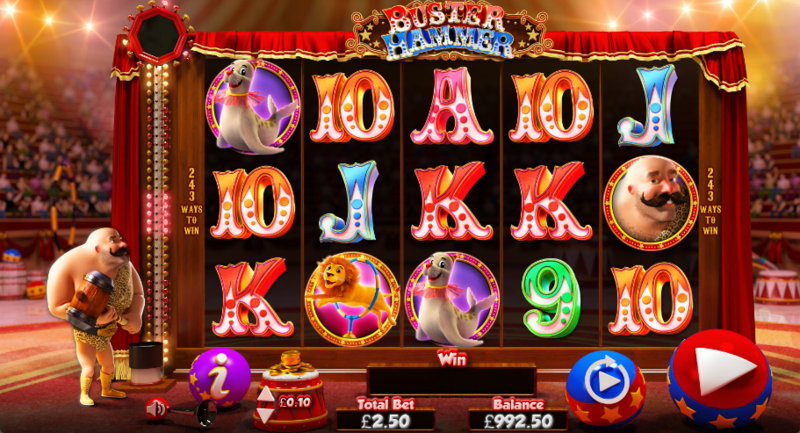 Buster Hammer is a five reel slot with three rows and 243 ways to win – there’s no payline structure, combos can be formed as long as you have matching symbols in adjacent reels starting from the left hand side. The setting is a huge circus tent and Buster stands to the left of the reels, ready to strike with his hammer. There are four theme-related symbols including Buster, a performing seal, an elephant balancing on a ball and a lion jumping through a hoop. 9, 10, J, Q, K and A make up the lower values. Buster’s Hammer is the wild symbol and it substitutes for all others except the circus tent scatter – that’s the trigger for the main feature. Each time a wild hammer symbol appears in a winning combo, Buster will swing his hammer at the contraption on the left to reveal a multiplier for that win of up to 5x. Unfortunately it’s not possible to trigger any more spins during this round. This occurs randomly during the base game and initially will award up to 5x the total bet; Buster will then whack the bell at least once to generate multipliers. All those multipliers will then be added up and applied to the total stake. Buster Hammer is a really high quality slot with some interesting themed bonus features; the RTP is slightly different depending on which free spins option you choose but not enough to make a difference. Check it out!